Compiler.app is an automation tool aiming to be an easy one click solution setting up a magic lantern development environment on a mac. Main purpose is to get fast access into som basic functions such as changing branches, compile on a platform, module etc. Hopefully this also will encourage newcomers to get straight into compiling and testing. The tool can be used even if you already have a development environment installed. Most of the stuff is a continuation of what is brought into this thread by dfort. Bigger part of dfort quick installation script is included into Compiler.app. On installing there comes the question "Press RETURN to continue or any other key to abort" ... there is no difference between RETURN and other keys. But hey, I can compile! Yes, I´m aware of the abort failure. Will fix it. It´s in the script from dfort. Thanks for pointing that out. You can drag any repo onto Compiler.app and that will become the repo you work from after this. It´s only installing default magic-lantern repo on vanilla installs(If this is what you´re asking regarding installing to another directory). This means you can move repos anywhere after downloading them and when dragged to Compiler.app work from there. 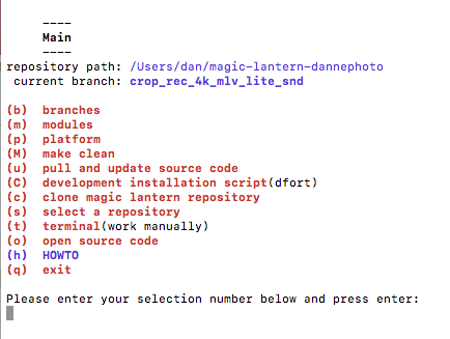 @Danne - updated the quick install script from the Compiling Magic Lantern on a Macintosh tutorial with your changes. Since the script lives on the forum and is not under version control please check it to make sure we stay in sync. A better option is if you have the script in your repository I can just link to it from the tutorial so it will always be in sync. I already put in a link to this topic in the tutorial. The quick installation script would be put into a repository you mean? Or it could be detached into a subscript in Compiler.app and the referred/linked to but then it wouldn´t be a copy paste thingy since I did some minor changes to fit the compiler. Maybe best to create a repo here? I could update it as I add changes in Compiler.app. @masc: as long as you have arm-none-eabi-gcc in your PATH, ML makefiles should pick it up without any tweaking. This looks up the compiler, so you can see what it tries. @Danne: yeah, looks like we're already out of sync. I was thinking of something along the lines of this stackoverflow tip. 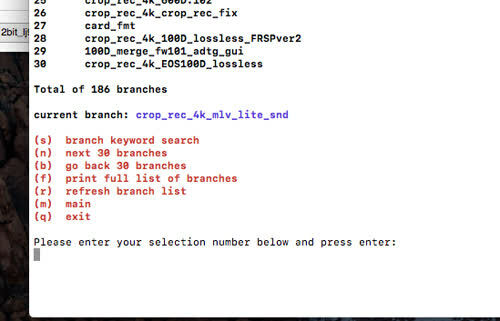 My quick install script is meant to be copied and pasted into the terminal so the part that writes the file to disk before executing then deleting it when finished needs to be changed. BTW--looks like we're both using a non-portable bash shebang and should probably change it to "#!/usr/bin/env bash" like we did in the QEMU scripts. If this seems a valid change I could replace the (preferred) gcc-arm versions with this? @dfort. I´l look into your suggestions. [ ! -f "`which brew`" ] && /usr/bin/ruby -e "$(curl -fsSL https://raw.githubusercontent.com/Homebrew/install/master/install)"
So no more excuses for Mac users not setting up a Magic Lantern development environment! Thanks for keeping the install script separate so that it can be run as a stand alone script. Now it is under revision control just like a "real" app. Linked to this project from the Compiling Magic Lantern on a Macintosh tutorial. Nice collaboration dfort and good idea to keep the script as a separate tool inside Compiler.app. I tried that, but for me it does not work. That means compiler.app does not find the arm compiler and wants to install it. Did I miss something? Thx Danne! That works! I commented these lines out. Great masc. And good tip from A1ex. 'main.command' can not be opened because Sandbox is not allowed to open documents in Terminal. P.s. 'Show contents' in Compiler.app and running 'main.command' in Terminal did the trick! Interesting. Did you open it by ctrl click and open the first time? By the way. What OS are you using? Yep. Tried Ctrl-click the first time. Failed. The latest macOS 10.13.4 on an iMac (Retina 5K, 27-inch, 2017). Cool. I'll see if I can reproduce this and then upload a fixed version. Compiling working as expected? Unfortunately the terminal is cleared after compiling. So it is impossible to see the other errors. I will remove the magic-lantern and qemu-eos folders and start from scratch. 80D, that camera hasn't got magic lantern working yet I think? 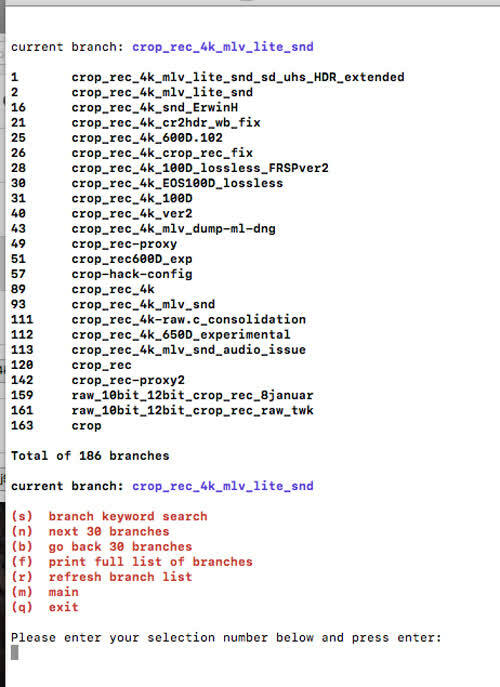 What branch were you compiling in? You can scroll up in terminal after compiling to see what else didin't work even after window is cleared.